Health and fitness fads are always coming and going, making it difficult to keep track of what we should and shouldn’t be consuming. But one health product that is becoming increasingly popular is bee pollen. It is collected from flowers by bees, and is a mixture of pollen, saliva and nectar Praised by the likes of Victoria Beckham, the protein rich ingredient contains nearly all of the essential nutrients needed by the human body to function efficiently – and incorporating it into your diet is believed to have many benefits. What is bee pollen? Hailed as a superfood thanks to its nutritional content, bee pollen has been used in many countries around the world for centuries. It is made of pollen which is collected from flowers by bees, and is a mixture of pollen, saliva and nectar. 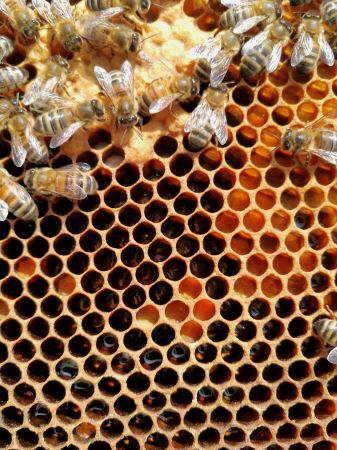 Bee pollen is a popular natural remedy for hay fever and other allergies After the pollen has been collected, bees will bring it back to the hive and store it in honeycomb cells. This is then covered with a thin layer of honey and wax, which will ferment to create what is known as ‘bee bread’, serving as a source of protein for the bee colony. What are the benefits? Bee pollen is approximately 40 per cent protein and is rich in vitamins, amino acids, minerals, enzymes and antioxidants. Bee pollen can be added to foods like cereal, smoothies or yogurts, or eaten raw. Its high nutritional content has earned it a reputation as one of nature’s most complete, nourishing foods, and its addition to your diet is believed to bring with it a number of health boosting benefits. It boosts your energy and metabolism Being rich in protein and amino acids, bee pollen can help your metabolism to work more efficiently, as well as keeping energy levels high. It’s an anti-inflammatory The flavonoids contained in bee pollen possess anti-inflammatory properties, helping to relieve pain and swelling, as well as promoting healing against cuts or burns. It’s good for allergy relief. Bee pollen is a popular natural remedy for hay fever and other allergies, thanks to being rich in vitamins, minerals, enzymes and proteins, lending it powerful antibacterial properties and helping to stimulate the immune system. The pollen can help to inhibit the activation of mast cells in the body, which are an integral part of allergic reactions. It’s high in antioxidants. Due to its high content of the antioxidant rutin, bee pollen is believed to enhance the function of the cardiovascular system, while the enzymes it contains can reportedly be beneficial in preventing various diseases, including diabetes, hypertension and cancer. It increases fertility. Adding bee pollen to your diet can help to boost fertility, as it stimulates ovarian function. It also helps to improve the ability of eggs to survive the incubation period, resulting in a greater chance of pregnancy. It reduces stress. Bee pollen contains a high level of B vitamins (B1, B2 and B3), which are essential for a healthy nervous system, and pollen’s ability to increase blood flow to the system can be effective in reducing stress and anxiety. It’s good for your skin. As well as being an excellent source of minerals and vitamins, bee pollen helps to stimulate the circulation of blood to skin cells, helping to detoxify the body and making the skin less vulnerable to blemishes and wrinkles. How can I eat it? Bee pollen can be consumed raw, or added to foods such as smoothies, cereals, yogurts or hot drinks. While there is no set dosage, consuming one teaspoon up to three times per day is typically recommended, while those taking capsules or pills should follow the dosage directions on the product packaging. Who should avoid it? Individuals with allergies to honey, pollen, or bees should avoid taking the product, and speaking to your doctors before taking it as a supplement is also advised.